A Little Bit Crunchy A Little Bit Rock and Roll: "The Talk"
Today I have to have "The Talk" with my 5 year old daughter. It really shouldn't come as a surprise to me. It is the conversation some of us parents dread. I believe it is necessary to have it sooner rather than later. I just can't allow this kind of thing to be happening under my roof. what she did after that is what saddens me. Today I will be discussing toilet paper orientation with my daughter. I'm not sure how the conversation will go. "But mommy.... WHY does the toilet paper have to go OVER instead of UNDER???" I completely applaud you. It's def a serious situation, but one that no parent ever thinks they'll have to deal with. Thank you for raising awareness. 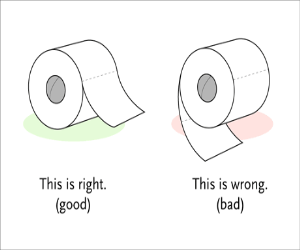 haha - i have this argument (discussion) with my partner every time he refills the roll. but "because i said so" doesn't always work with a 34 year old grown man. So instead, i just try to get to it before he does. even if that means peeing more often than i need to. You could talk about the value of consistency. Who wants to guess whether to roll up or down in the middle of the night? I've been alive longer than you and I have been trained to have it down. Therefore, I am passing this training onto you. You had me a little freaked out there - I have a four-year-old and was thinking... already? I have to have this talk already? But then you eased my fears by reminding me of the silver bullet, the to-be-used-sparingly but highly effective "Because I said so" bullet. There's little in this world that can tear a family apart like having to tear apart a roll of inconsiderately installed toilet paper. Good luck! I hope the talk goes well. Nice blog. Must read by everyone.